In 1952, Joshua Lederberg, at the University of Wisconsin-Madison, introduced the general term plasmid to refer to DNA molecules that were separate and outside chromosomal DNA. It was Lederberg’s intention to use a generic term to collectively classify a diverse group previously termed parasites, symbionts, organelles, or genes. In 1973, interest in plasmids dramatically escalated when they were found useful as tools in molecular biology and genetic engineering, primarily through the combined efforts of geneticist Herbert Boyer and biologist Stanley Cohen. They showed that it was possible to transfer a gene from one species (frog) to another (the bacterium Escherichia coli), and demonstrated that the transplanted gene could function normally in its new host. Plasmids also play a major role in the evolution of microbial resistance and the capacity of microbes to cause disease. Plasmids can replicate (copy themselves) in the cell independent of chromosomes and frequently have backbone and accessory genes: The backbone genes participate in the replication and maintenance of plasmids. By contrast, the accessory genes are not essential for the survival of the host (bacterium in which the plasmid resides), but may encode functions that provide advantages to it. These include the ability to degrade environmental pollutants and use them as sources of carbon and nitrogen, or enable the host to become resistant to the toxic effects of antibiotics or heavy metals. In addition, plasmids can be transferred between and among bacterial species. This transfer serves as a major mechanism by which bacteria can easily and rapidly acquire a variety of traits, permitting them to adjust to a changing environment. Plasmids have been very widely used as tools in genetic engineering, as in gene cloning, gene therapy, and recombinant protein production. In 1978, Boyer, a founder of the pharmaceutical biotechnology company Genentech, produced synthetic human insulin using this technique. A foreign DNA element, such as a gene for insulin, was spliced into the plasmid, which was introduced into the bacterial cell. Replication of the plasmid within the bacterial cell turned out large number of copies of the recombinant insulin. SEE ALSO: Apoptosis (Programmed Cell Death) (1842), Antibiotics (1928), Bacterial Genetics (1946), Amino Acid Sequence of Insulin (1952), Bacterial Resistance to Antibiotics (1967). 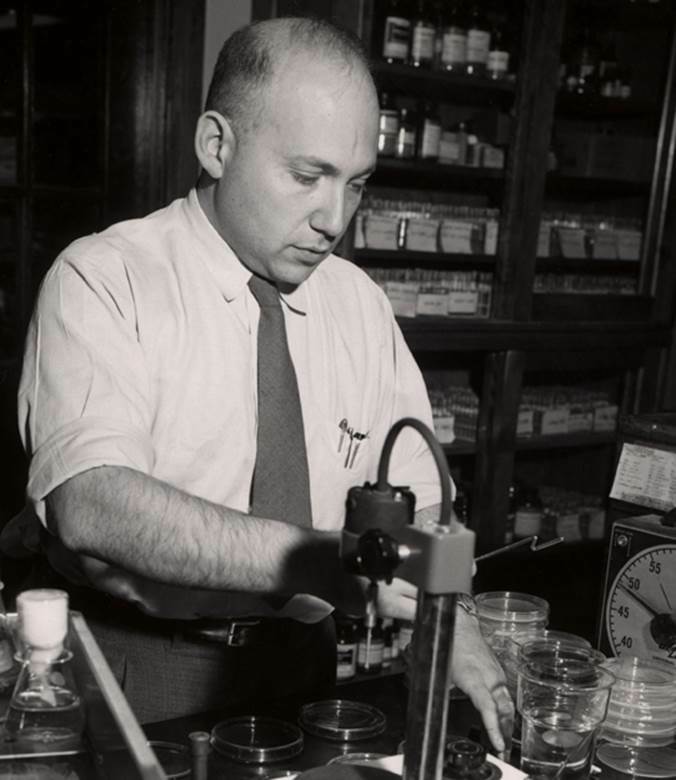 Joshua Lederberg at work in his laboratory at the University of Wisconsin, 1958. In addition to his discovery that bacteria can exchange genes, he is also well known for his contributions to artificial intelligence and space exploration.